If you are the new age groom of today, chances are you may want to experiment outside of the Sherwani box for your big day or maybe for pre-events like cocktails or Sangeet! These hot new silhouettes for grooms who want to do something different. Bandhgala with Trousers /Jodhpuris:- Having a destination wedding? Want to make all the girls swoon at your sangeet? Then a classic Bandhgala in a paired with Jodhpur trousers or even regular pants is your perfect bet. You can wear these in bright reds, classic white and beige, or even pastels. Wear it to your mehendi or even to your day wedding! Best for Grooms with leaner bodies. 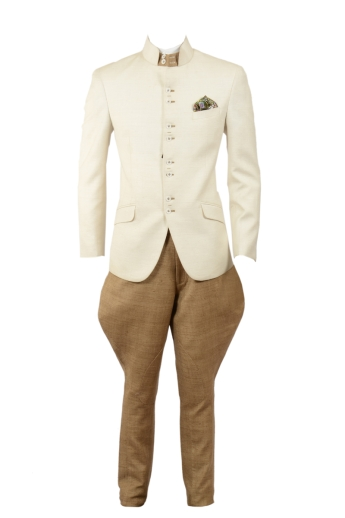 Achkan with Dhoti or Draped Trousers:- For the groom with style, this is one of our favorite silhouettes. An achkan is paired with a dhoti for a regal vibe with a contemporary twist. If the thought of wearing a dhoti makes you go eh, worry not because Brahaan also offers cowl pants which you can wear as regular trousers but give the look of dhoti pants. Best for: All types of body shapes. This looks good on everyone. Anarkali Style Silhouette:- The Anarkali style Sherwani combines a slightly flouncy skirt under the Sherwani jacket for a look right out of the Mughal era. Wear it on your wedding day or reception for a Jodha-Akbar look. Best for Grooms with good height. The cowl neck or Attached muffler silhouette:-Take your regular Bandhgala or suit many notches higher with the attached cowl neck or muffler silhouette. Not only is this super fashion forward, it also goes a long way in keeping you warm if you are having a cold winter wedding. Best for Grooms with winter weddings. Suits with printed waistcoats:- Give your tux a whole new look with a printed waistcoat and matching bow tie. A fun twist to suiting up, this one is for the grooms who want to add a bit of flair while still looking formal. Best for Grooms who aren't afraid to go the funky route.